At some point, most of us have to organize and communicate large quantities of information with a lot of complexity. This is true whether you're a medical professional, a business analyst, or an engineer. And it's true when you're a programmer, a consultant, a lawyer, a teacher... you get the point. And this is a big problem. Because most of us are not very good at it. When we've got a ton of complicated stuff to explain, what ensues is rarely clarity, inspiration and enlightenment. It's chaos, confusion and boredom. And that's why, in this post, I'm calling for help from the brainiest people on the planet - people who wrestle daily with more data and complexity than just about anyone. But... aren't they, like, some of the worst communicators out there? Yep, many of them are. But some of them do it pretty darn well. And when they do, it's a thing of beauty: Massive data and complexity yield to clarity, logic and fascination. Here are four tips I guarantee will help you step up your presentation game. I'm not a scientist. My background is in public policy. But I've been working with scientists of all disciplines from every continent for the past seven years. I've seen horrendous presentations, and I've seen tremendous ones. I've absorbed too many workshops, books and articles on the art of presenting science. What I found was a remarkable consensus on what makes for effective science presentations. And despite what you might think, it's not much different from non-scientific presentations. At its heart, a great scientific presentation is a great story. In spite of what we may associate with science - massive data, complex dynamics, incomprehensible charts and stuffy mood - the heart of great scientific presentation is to tell a compelling story. But how do you tell a story? Well, the story manifests itself most clearly in the structure. In fact, it is because science deals with so much information and complexity that it needs a story structure with tight, logical progression to organize its myriad elements. Without a strong structure, the presentation would soon crumble along with the audience's interest. Sure, different presentation types differ here and there (science is heavier on context, prior research and methodology; Pitch is light on context but big on business model, competitor analysis, etc. ), but the basic underlying structure is very similar. And it's no accident. This type of structure is simple, clear and logical. When your presentation involves a huge amount of data and complexity, this structure is a highly effective and dependable way to organize the elements. It makes the story far easier for you to remember and deliver, and far easier for your audience to follow and remember. Here's a cool example of science as storytelling by Dr. Fergus McCauliffe, who won the Grand Final of 2013 FameLab International - a global competition involving thousands of science communicators, who each gets three minutes to presents their science. If you wanna know how he did it, here is him explaining his secrets in a TEDx Talk: Sharing Science through Story. Most of us have trouble understanding scientists. But a roomful of scientists surely understand each other perfectly, right? In fact, it's typical for scientists to sit through each others' presentations with the same questions we'd have: "What are you talking about? And why should we care?" This is because scientists from different fields don't normally interact, and don't know what each other is up to and for what. The lesson is clear, for scientists and non-scientists alike: few audiences will automatically understand and care about your presentation. You must purposefully make your message accessible and relevant for them. Notice how, in his winning talk, Fergus McCauliffe didn't launch straight into the biology of frogs? Instead he talked about life and death - something we all know and care about. And there's a reason Neil DeGrasse Tyson - arguably the best science communicator alive - constantly references pop culture in his speeches, writings and tweets. Let me give you one more example - a favorite of mine. It's one of the best presentations I've seen in recent years, from seismologist Dr. Mark Quigley on the risk of earthquakes. For almost an hour he held the attention of 400+ eminent but sleep-starved scientists from around the world. And here's how he dealt with the audience. He started by saying: "I'm here to tell you a story. It's a story of science, but it's also a personal story." He then recounted the terrifying Christchurch Earthquake of 2011, which triggered an emotional response from most of us. Then, before launching into the science of earthquakes, he said: "I came to your evening party two days ago to try and suss out this audience, and I discovered that you're from truly diverse academic backgrounds, but most of you are not earthquake scientists. So let's start from the basics..."
He succeeded by starting not with himself, but from where the audience is. This does NOT mean dumbing things down. It does NOT mean stripping your presentation of all nuance and details. If you cannot sum up each part in under three sentences, you've got a problem. Do NOT include too much detail - if people want the details, they'll ask you for them. And that'll only happen if they liked your presentation in the first place, which would never happen if you bore them with details. Don't tell them everything. 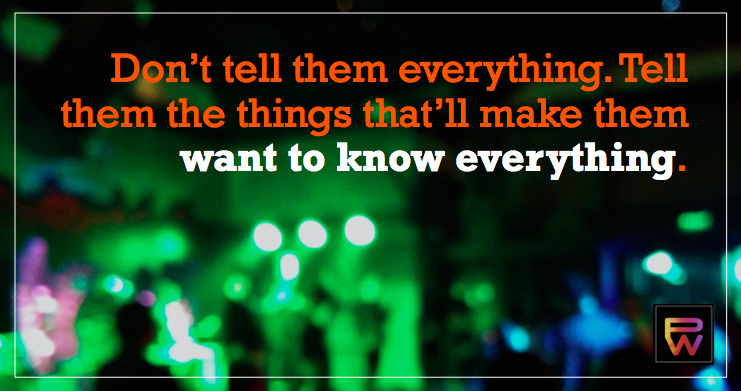 Tell them the things that'll make them want to know everything. Is this absolutely central to the story I'm telling? If I elect to keep it, how can I frame it in terms of the main storyline or message? This 3rd question is often neglected by even good communicators. They'd introduce a piece of detail, but just leave it "hanging" by itself, unconnected to the rest of the story. If you must include a piece of detail, always tie it back to the main storyline. And keep in mind, these are tips on presentations by and for scientists, who are better than most of us at absorbing detailed information. If they cannot handle so much detail, what chance does your regular, mixed audiences have? This is what great science communicators do. And they do it even with fellow scientists who are adept at handling massive complex information. With regular audiences who are less inclined and skilled at absorbing big data and complexity, these tips become absolutely critical. How to give a dynamic scientific presentation, by the publisher Elsevier. How to give a science flash talk, by SciDev.net - this is for situations where you only have 2-3 minutes to present. The tips and skills mentioned in this post become even more critical! 10 secrets to giving a good scientific talk from the National Center for Atmospheric Research, one of the top research establishments in the world. Dr. Randy Olson is a "scientist-turned-filmmaker" who has produced some of the best work on science communication. I highly recommend his book Don't Be Such a Scientist. His latest work is Houston, We Have a Narrative (although I've not read it).